One part of the lead roof covering was stolen from Our Lady of Ljevis church in Prizren, and the Bishop of Ras-Prizren Teodosije has lodged a protest with the international institutions in Kosovo. The Kosmet Ministry stated that the Kosovo police is unable to adequately provide security for the monasteries of the Serbian Orthodox Church (SPC) and Serbian cultural and historical monuments in Kosovo-Metohija. One part of the lead roof covering was stolen from Our Lady of Ljevis church in Prizren, and the Bishop of Ras-Prizren Teodosije has lodged a protest with the international institutions in Kosovo, the Eparchy of Ras-Prizren said in a statement Wednesday. Teodosije asked the international officials not only to start an urgent investigation to find the perpetrators, but to hold the Kosovo police accountable, since its negligence made the robbery possible. This is the third time a part of the church’s lead roof has been stolen in the last five years. Our Lady of Ljevis burned down during the March pogrom of 2004, and the restoration has been ongoing ever since, under the programs of the Council of Europe and UNESCO, which included the church on its world cultural heritage list. The next stage of the renovation should include the thorough protection of its frescoes, adds the statement from the Eparchy of Ras-Prizren. Minister for Kosovo-Metohija Goran Bogdanovic said that the Ministry today demanded that the perpetrators of the theft of 20 square metres of the lead roof from the roof of the Church of the Virgin Ljeviska in Prizren are identified and punished, and requested that this cultural-historical monument is provided with adequate protection from desecration and attacks. Bogdanovic pointed out that this is the third such theft of the lead roof from the roof of the church in the last five years. Devastating is the fact that the church is guarded by the Kosovo police, whose checkpoint is in front of the church. The Ministry for Kosovo-Metohija has been pointing and warning that the Kosovo police is unable to adequately provide security for the monasteries of the Serbian Orthodox Church (SPC) and Serbian cultural and historical monuments in Kosovo-Metohija, said the Minister. He stressed that the Ministry requires EULEX, UNMIK and KFOR to seriously reconsider further involvement of the Kosovo police on the protection of SPC churches and monasteries, especially those on the World Cultural Heritage list. Practice has shown that adequate protection of Serbian religious and cultural heritage sites can only be provided by KFOR, he said. 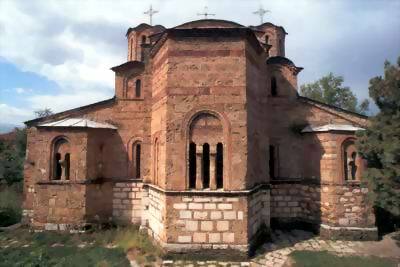 The Ministry for Kosovo-Metohija shall do its part to fix the damage on the church, said Bogdanovic and recalled that this 14th century church has been included on the list of World Heritage by UNESCO. This entry was posted in Featured News, News and tagged EULEX, Kosovo Metohija, Ras Prizren, SPC by OCP. Bookmark the permalink.